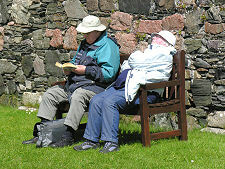 Iona has been a focal point for Christianity in Scotland since St Columba's arrival here in AD563. 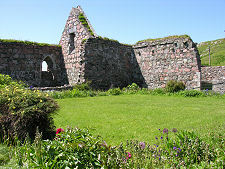 In about 1200, Reginald MacDonald of Islay, one of the sons of Somerled, decided to revive old traditions partly lost as a result of Viking raids, and turn Iona into a centre of Christianity important enough to rival anything on the continent. What was left of an earlier Columban monastery was replaced with a very much grander Benedictine monastery built on the same site. 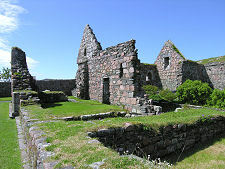 Reginald also built an Augustinian Nunnery on the island. He installed his sister Bethoc as its first prioress. 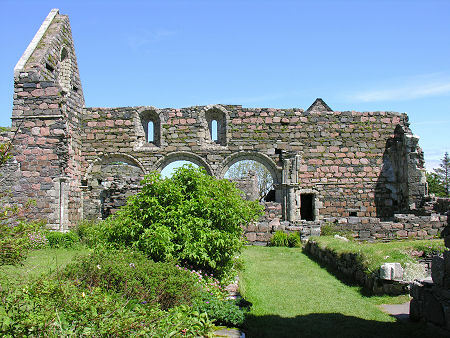 The nunnery now stands in ruins, but despite this it remains one of the best-preserved medieval nunneries in Britain, and one of only two houses of Augustinian nuns established in Scotland (the other was in Perth). 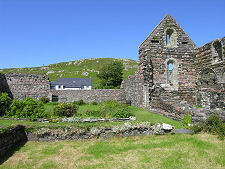 The site he chose was a quarter of a mile south west of the site of the abbey, and today lies on the edge of the main (and only) village on Iona, Baile Mòr. The steady stream of visitors heading for Iona Abbey pass through the grounds of the nunnery en route from the ferry slipway. You enter the nunnery grounds through a gate in a wall on the gentle hill that climbs west from the centre of the village. 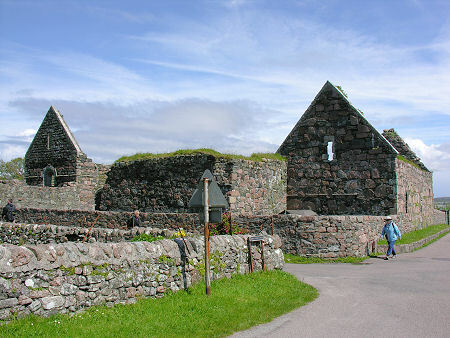 The nunnery was constructed as four ranges surrounding a cloister, and while it never grew to be anything like as grand as Iona Abbey, the complex you would have found here 700 years ago would have been extremely impressive. 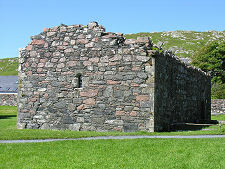 The nunnery church occupied the north range of the nunnery, and although unadorned by tower or spire, it would have been the tallest and most imposing of the buildings. Today the church is one of the two best preserved areas of the nunnery, with one end wall and one side wall largely intact, along with the north transept, which now forms the only "enclosed" space in the nunnery. 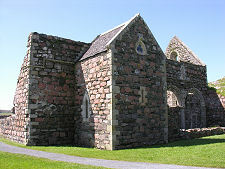 As originally built, the west end of the church comprised the nave, which would have been available for use by pilgrims to Iona. The east end of the church was the chancel, used by the nuns themselves for their round of services. 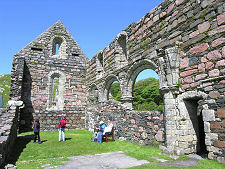 Also relatively well preserved is the nunnery's south range, which originally formed the refectory. The east range is today little more than low walls which serve as a viewing frame for the remainder of the nunnery from the path through the grounds. One of the three rooms here has been identified as the chapter house, and it is probable that an upper floor would have contained a dormitory. Across what is now a beautifully landscaped garden occupying the area of the cloister, the west range is represented by a single wall that backs onto the modern road. Much of the west range was lost when the road was built. 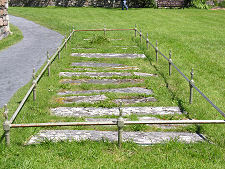 A little to the north of the nunnery, but today sharing the same grounds, is an oblong building constructed of the same mix of red and grey stone used in the nunnery itself. 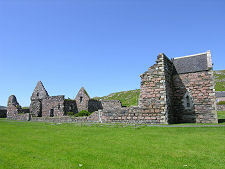 This is St Ronan's Church and served as the parish church of Iona from around 1200 until the Reformation in 1560. Thereafter islanders had no formal place of worship until a new parish church was built in 1828. St Ronan's Church was restored in 1923 and again in 1993, and is not accessible to the public.